Combined dynamic neutron radiography (DNR) and vibration diagnostics (VD) measurements were performed on thermostat of refrigerators. For a given type of refrigerator we could find the origin of the defective functioning by visualizing the inner processes by DNR. 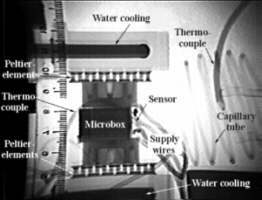 An explanation was given for the delayed starting of the compressor in the refrigerator, moreover the optimal mounting position of the thermostat was determined thereby avoiding the vertical outflow of the sensor. On the other hand, VD proved to be a useful complementary technique to detect the characteristic motion of the thermostats on the disassembled membrane. Dynamic neutron radiography (DNR) has proved to be a useful method in visualization of inner working processes in various thermodynamic devices [1-8]. Recently we have published our first results on thermostats using DNR method . As far as, DNR measurements are performed at research reactors, demand has arisen to combine the DNR visual observations with other methods, that can be used in the factory's quality control link system. We have extended, recently, our DNR investigations with vibration diagnostics (VD). The VD technique is widespread used in cooling unit diagnostics, however, it can only detect the noise effects, but it can not discover the origin of unwanted noises. The DNR station at the 10 MW Budapest research reactor services as a high performance experimental facility for investigating model units and actual industrial objects under running conditions . The neutron beam is obtained through a horizontal thermal channel of the reactor using a pin-hole type conical collimator. The collimation ratio is 170, the beam diameter is 150 mm and the neutron flux is 108n cm-2 sec-1 at the detector position. Objects with a surface area of 700 × 1000 mm2 and weights of up 250 kg can be investigated and are manipulated into the correct position of the beam by means of a remote control mechanism. The transmitted neutron image of the object is converted into light by a scintillation converter screen (type NE 426) and the "light image" is detected by a low-light-level TV camera (10-4 lux for type TV1122). The imaging cycle is 40 msec, thereby providing the positioning for visualizing medium speed movements up to about 2.5 m sec-1 inside the investigated object. The resolution of the detected radiography image is about 150 mm. The schematic block diagram of the imaging system is shown in Fig. 1. The radiography images are displayed on a monitor, stored by an S-VHS recorder and for further analysis, an image processing system is used (type Sapphire 5.05 by Quantel). A hard copy of the picture is provided by a video printer. In addition to the radiography image other parameters characterizing the operation of the investigated object - such as operating time, pressure, temperature, flow velocity, power consumption - are measured and controlled. The study of the thermostats were obtained in the neutron radiography laboratory. The same auxiliary equipments were applied as they were on the neutron radiography station A 4343-type accelerator sensor was used as the detector of the noise events in the thermostats. The signals were amplified by 2635-type charge amplifiers and registred by a NAGRA-IV. S-type stereo magnetofon. The sensor and amplifier were produced by Brüel and Kjaer company. The magnetofon was made by KUDELSKI SA from Switzerland. 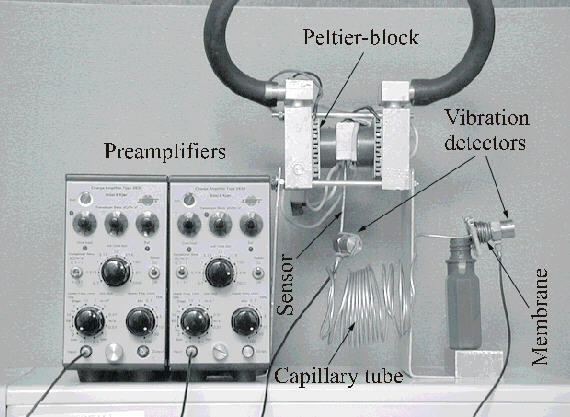 The evaluation of the noise spectra is performed by a 2033-type Dual Channel Frequency Analyser, which was made by Brüel and Kjaer company. 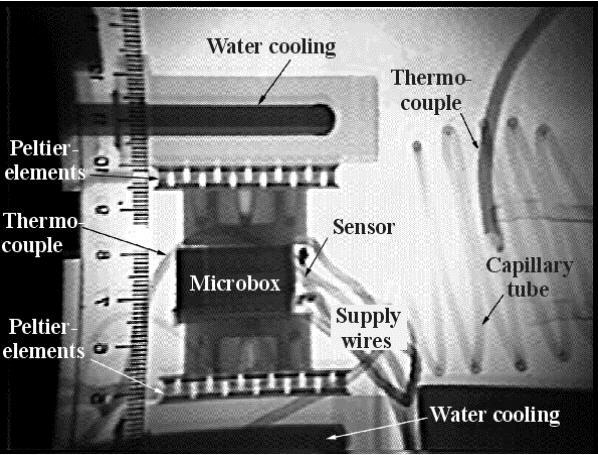 The sensors were fixed to the surface of the examinated thermostat as it is shown in Fig. 2. One of them was placed on the sensor, while another one on the membrane. Temperature control of the domestic refrigerator is solved by a low temperature thermostat. Here a capillary tube is used as a sensor, containing as propellant gas the same material as the cooling agent, viz. the environmentally friendly R-134a. By increasing the temperature the propellant gas expands and it deforms the membrane above 15 oC. This minute motion mechanically actuates an electrical contact, thereby the compressor is started. After a certain time (» 10 minutes) the gas cools down and it condenses. When condensation takes place the pressure is drastically reduced and the compressor is stopped by the membrane. The operating range of the given thermostat family is between -40 oC and 15 oC. The goal of our study was to explain the cause of the delayed starting of the compressor in the refrigerators. The supposed cause of this defective operation was the incorrect functioning of the thermostat. First of all we designed a special small cooling tower with the aim to avoid the disturbing effect of neutron scattering of the insulation materials of the refrigerator box. Within the special tower is a double level, water cooled Peltier-block which contains a microbox, that's minimum temperature - 40 oC. Its neutron radiography picture is illustrated in Fig. 3. Since the behaviour of the propellant gas depends on the position of the thermostat sensor it was possible to investigate it by this rotatable arrangement. 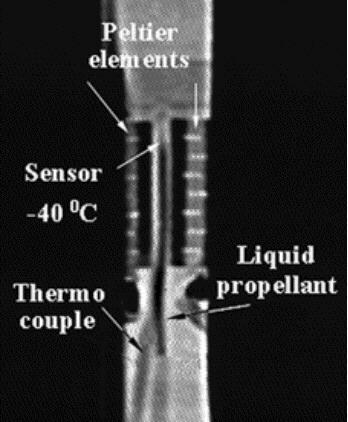 Figure 4 shows the long, liquid gas column at -40 oC in the vertical position of the sensor. When the compressor switched off, the temperature began to increase slowly and the length of the liquid was reduced slowly. At -5 oC the residual column suddenly collapsed generating a relatively strong pressure change in the capillary tube whereupon the membrane restarted the cooling procedure. After some seconds the liquid returned to the sensor and the cooling was stopped immediately. This finding proved to be the explanation for the delayed starting because the compressor has a contact breaker to avoid damage caused by the repeated starting. The circuit waits for five minutes after such an event before it switches on the power again. The above described model experiment was continued on actual refrigerators and our statement was supported by the results. We were therefore able to determine the correct mounting position for the thermostats. By adjusting the thermostat to the correct mounting position, the vertical outflow of the sensor was avoided and the problem was solved. The membrane of the thermostat was disassembled from the frame of mechanical actuator. We had to fix directly the accelerator sensor to the surface of the membrane (see Fig. 2), because the noise level of the propellant material's motion was very low. In the first arrangement the position of the sensor was vertical in the cooling tower, where the end of the sensor was upper. Two VD detectors were used. 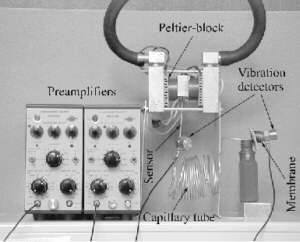 The first one detected the noise on the capillary tube under the Peltier-block, and the second one was placed on the membrane (see Fig. 2). The temperature of both places were measured by thermocouples. The noise of the cooling procedure was not detectable. When the temperature was increased the motion of the membrane gave a well distinguishable double noise at -5 oC. The measured water-flow diagram is shown in Fig. 5/a. Each spectrum was measured during one second. The running time was measured from the beginning of evaluation. It is independent on the time schedule of the worming procedure. The form of the line is depending on the detected noise. A primary noise was detected at the 28th second and at the 30th second was detected a higher intensity noise. This is a typical hazard situation for the contact breaker of the compressor to delay the restarting of the cooling procedure. Figure 5/b shows the water-flow diagram measured on the capillary tube. The switching phenomena was detected at the same time except the double wave form, and the intensity of the noise was smaller. After the cooling tower position was turned by 90o, and the position of the thermostat sensor became horizontal, the VD measuements were repeated (Figs. 6/a,b). Figure 6/a shows a relevant sharp switching effect of the membrane at -10 oC without any secondary noise. Later we tried to extend the VD application in the measurement of the controller system in the complete refrigerator box. It seemed this technique was not available to use because the isolation technology and the high background noise of the evaporator system prohibited the success of the experimental work. DNR has proved to be an effective non-destructive technique for visualizing and analysing the phenomena in thermostats. For a given type of refrigerator we could find the origin of the defective functioning. An explanation was given for the delayed starting of the compressor in the refrigerator, moreover the optimal mounting position of the thermostat was determined thereby avoiding the vertical outflow of the sensor. On the other hand, VD proved to be a useful complementary technique to detect the characteristic noise effects in the thermostats on the disassembled membrane. Unfortunately, VD could not be used to test thermostats in the refrigerators during their operation, because the mechanical arrangement of the controller system was not available for the practical measurement. This work was supported by Grants OTKA 029433 and IAE-9609. M. Balaskó, E. Sváb, L. Cser, L. Pálvölgyi, J. Oláh: "Visualisation of dynamic processes by neutron radiography", Proc. 3rd European Conference on Non-destructive Testing, Firenze (Ed. C.M. Rosa, Queriniana, Brescia) Vol. 4, 383, 1984. M. Balaskó, S. Könczöl, E. Sváb: "Neutron radiography study of pulsed boiling in a water filled heat pipe", Inter. J. Refrig., 9, 80, 1986. J.M. Cimbala, D. Sathianathan, S.A. Cosgrove, S.H. Levine: "Neutron radiography as a flow visualisation tool" and references therein, Proc. 3rd World Conf. Neutron Radiography, Osaka, Japan, 1989, Neutron Radiography (3) (Ed. Kluwer Academic Publishers, Dordrecht, 497, 1990. M. Tamaki, I. Kosaka, M. Komada, I. Matsuzaki, A. Yoneyama, Y. Ikeda, K.Ohkubo, G. Matsumoto: "Hydrodynamic behavior of liquid, vapor and non-condensable gas in a closed two-phase flow system" and references therein, ibid. 523, 1990. Y. Ikeda, K. Ohkubo, M. Tamaki, T. Kinebuchi, T. Mihara, K. Yoneda, S. Fujine, T. Matsumoto, O. Aizawa: "Real-time neutron radiography for fluid dynamics and molten metals behavior" and references therein, ibid. 531, 1990. J. du Parquet, G. Bayon: "Contribution of neutron radiography to the conservation of the environment", Proc. 4th World Conf. on Neutron Radiography, Ed. J.P. Barton, Gordon and Breach Science Publ., 65, 1993. H. Asano, et al. : "Application of neutron radiography to a diagnosis of refrigerator", Proc. 2nd Int. Topical Meeting on Neutron radiography System Design and Characterisation (Eds. K. Mochiki and H. Kobayashi, Rikkyo, Japan) 392, 1995. M. Balaskó, I. Járfás, I. Szikra: "Dynamic neutron radiography for testing thermostats" Proc. 6th Word Conference on Neutron Radiography, Osaka, 1999, Eds. S. Fujine, H. Kobayashi, K. Kanda, Gordon and Breach Science Publ. Pennsylvania, 433, 2000. M. Balaskó, E. Sváb: "Dynamic neutron radiography instrumentation and applications in Central Europe" Nucl. Instr. Methods A377, 140, 1996.